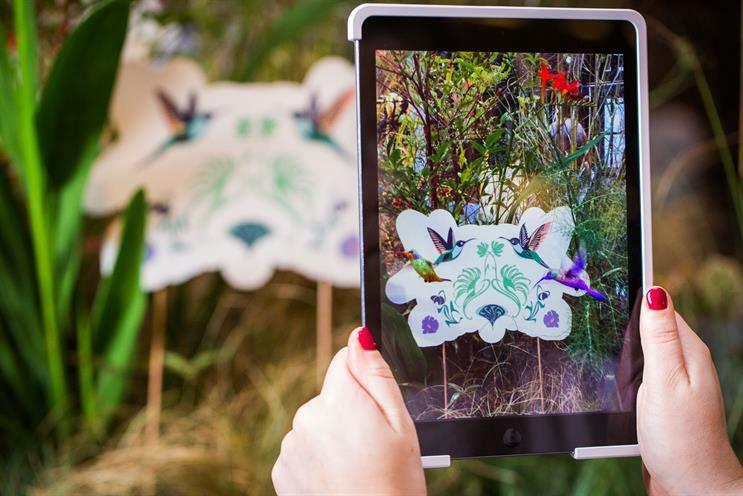 Perrier-Jouët is creating an interactive garden and is encouraging visitors to take a look at it through augmented reality. The Champagne brand’s activation for its newest cuvée Blanc de Blancs NV features flowers, plants, herbs, grasses, miniature trees and flowing water. These are all brought to life through an animated breeze that people can view through an app while in the garden. Guests will be asked to download the app and scan the Perrier-Jouët Blanc de Blancs box and markers around the garden to reveal butterflies, bees, hummingbirds and dragonflies amid the foliage. The activation has been created by experience designer Holovis, and Bacchus.Agency developed the tech. It runs from 27 October until 13 November at The Refuge in Manchester. Hamish Millar, marketing manager at Perrier-Jouët, said: "Perrier-Jouët has always had strong links with design and nature and what better way to launch our vivacious new cuvee Blanc de Blancs NV than with a garden that is full of life and surprises in the beautifully light atmosphere of Refuge at the Principal Hotel. "Reminiscent of our recent campaigns like L’Eden by Perrier-Jouët in 2016, the installation enchants through the tension of urban and nature, artistic substance and lifestyle."